I am attempting to develop my first custom component called com_image. Because of the structure and function of my project requirements, it made best sense to clone the com_contact folder and duplicate the necessary db tables/rows. I commented out lots of unnecessary structure from the component, but now I need to add something in. 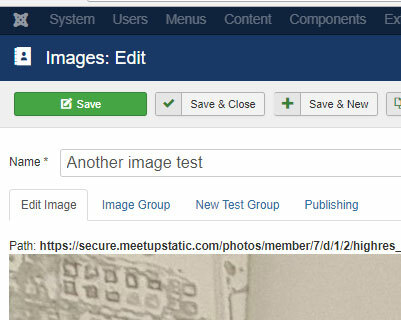 How can I generate a blue/info note for the "Edit Image" (first) tab at administrator/index.php?option=com_image&view=image&layout=edit&id=1 ? I don't know how to make $this->form->renderField(); work for me. I read https://docs.joomla.org/Creating_a_custom_form_field_type/en but this only solves half of the problem. I'd like to deliver this component with attention to mise en place for my own education -- so please only suggest best practices. Do I create a new .php file in com_image/models/fields so that I can extend JFormFieldNote? If so, how do I pass my $this->item->location value to getLabel()? And how to do I call the new custom note back from edit.php? I don't want to modify com_image/config.xml, right? I think GDP's answer is not quite right for my purpose: How can I dynamically generate a form's XML from PHP? p.s. If there is a better way to deal with the image element, I'd be happy to hear that too. Use Form::setFieldAttribute(). Typically, this is done in the model's getForm() method. However, if it's cosmetic only, it can be done in the view too. Not the answer you're looking for? Browse other questions tagged custom-component custom-field form-fields-types class-extensions or ask your own question.